Peter Friestedt is the architect of the West Coast/AOR super-group Champlin Williams Friestedt!!! If you were to play the impressive self titled 2015 Champlin William Friestedt the most obvious names that would jump out at you would be the former Chicago keyboard/vocalist Bill Champlin and Toto’s lead vocalist Joseph Williams. But actually it is the way overlooked versatile guitarist Peter Friestedt who is the creative engine who has slowly driven the formation of this sensational group close to a two decade era. However, we need to step back in time all the way to the late 90’s when at the age of 26 Peter Friestedt migrated to Los Angeles to continue his musical studies at the Los Angeles Music Academy. It was then he began to be recognized as a significant talent and also made great musical connections including the above mentioned Champlin and Williams who were an integrate part of Friestedt’s solo debut recording LA Project released in 2002. The album also featured two wonderful instrumentals “All Alone” and “Storyteller”. Six years later the even more confident Friestedt released the equally impressive LA Project II which also included the free flowing instrumental “Closer To Home” and the utterly stripped down reflective “Waiting For You”. A few of the songs on his sophomore effort were revisited on the 2011 self titled Williams Friestedt including the outstanding Toto-ish “Where To Touch You” as well as the simply sublime “Going Home” drenched in David Foster influences. With Bill Champlin finally formally boarding the superstar-ship, the band released the “Live In Concert” DVD in 2012 followed 3 years later by the previously mentioned self titled Champlin William Friestedt. Featuring a free flowing Friestedt electric guitar work on the gorgeous “Aria” and his once again impeccable production and songwriting capabilities, Friestedt is frankly the original architect of this outstanding group. With the EP 10 Miles released last year as a stop gap and we patiently await their brand new full length release. Nevertheless, the work of Peter Friestedt over the decades has been somewhat undiscovered in the mainstream musical world. But in the specialized world of West Coast AOR Soft Rock the guitarist, songwriter and producer Peter Friestedt is somewhat of a quiet legend, well revered to those that appreciate this brand of music. One can only hope that perhaps one day Friestedt will find the time to dedicate a recording to spotlight his instrumental guitar work that is so understated and underrated. If you were to complete an internet search on Mark Williamson you would get a lot of hits with this common name. 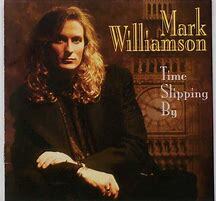 But what you would not get is a lot of hits on the uncommonly talented English born vocalist Mark Williamson. Sadly even the All Music Guide website gives very limited information and this borders on being criminal. With his initial solo recording So Far So Good being released back in 1979, his breakthrough came under the band name the Mark Williamson Band. Throughout his career it is without a doubt that Mr. Williamson’s faith is deeply rooted within his music. As one of the UK grandfather’s of Christian Contemporary Music courtesy of the impressive Get The Drift? recording also featuring Chris Eaton, this outstanding artist was capable of creating cutting edge music of that particular day. Essentially the same album was released Stateside under the band name Lyrix and album title Songs From The Earth with the addition of “Susanne” from his initial solo effort. Otherwise the Mark Williamson Band followed up their debut with the equally impressive 1984 Missing In Action also limited to the UK that despite its high quality, commercially it lived up to its title. Since then, Mark Williamson sightings have been infrequent but when he does appear the recordings are typically exceptional uncompromising songs matching his magnificent voice. Check out the 1989 commercial collaboration of the self titled Bridges 2 Far with the top notch studio session drummer John Robinson. Oozing in the West Coast/AOR genre Williamson followed up this effort 5 years later with his phenomenal second solo effort Time Slipping By. It was also the debut release on Russ Freeman’s new record label Peak Records. Needless to say it had all the trimmings of a big budget recording that is simply a gorgeous inspiring album with an all star cast supporting his huge voice. From the underlying smoky jazz feel on the opening track “Got To Be A Better Way" all the way to concluding a cappella track “We’d Be Together” shows Williamson in the upper stratospheres of inspiration. After a 13 year absence, 2007 proved to be a high profile year for Williamson. Featured in the band TRW, (an acronym for Michael Thompson, John Robinson and Mark Williamson), River Of Paradise was released in the earlier part of the year. Distributed by the Italian record label Frontiers Records, we get to hear Mark Williamson deliver a more bluesy rock performance. Later the same year the rockier TRW recording would be totally countered by his more restrained yet soulfully smooth vocal renditions on the worship based project Daily Worship. Sadly since 2007 all has been very quiet on the Mark Williamson front. Whether or not there will be another recording from this way overlooked vocalist, composer, and producer is yet to be determined. However do yourself a favor and at minimum search him out on You Tube and check out some of the tracks on the above mentioned recordings. It is highly likely that you will come to the same conclusion that this “Undiscovered Artist” needs be recovered and honored in the light of his majestic talent. A hint of a Tangier reunion in the wind should not get stranded!!! Formed back in 1984 around the playing and composing of guitarist/songwriter Doug Gordon the band quickly released their self titled album back in 1985. Limited to a local release Gordon held onto only vocalist Bill Mattson and revisited the remaining line up. 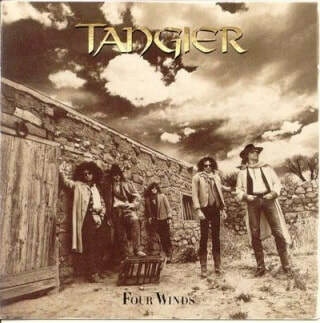 Four years later they not only had a record deal with Atco but also the infamous producer Andy Johns recording their impressive full fledge debut Four Winds. Apparently much like their touring partners Cinderella, Tangier were neatly wrapped up with their alleged peers of the current Glam rock scene but this was far from the truth as to the description of Tangier’s music. Sure it was straight ahead rock and roll but it was lathered in the blues thus unlike the stereotype tag they had already been given. Nevertheless Four Winds garnered some critical and commercial success with minor hits from the mid tempo bluesy tracks “On The Line” and “Southbound Train”. With vocalist Bill Matson out and Mike LeCompte in, both highly competent within their own right, the band seamlessly followed up with their equally impressive Stranded two years later placing them right in the grunge crossfire. Despite another minor hit courtesy of the title track the music scene was in major transition and needless to say Tangier disappeared to be one of the many casualties of the Glam versus Grunge war. However, the small but critically acclaimed label Rock Candy have just recently re-released the remastered Four Winds and the official website as recently as November of last year are reporting of working on new material and quite possibly recording in the near future. Frankly considering their mislabeling and mistiming nothing would be better than hearing Tangier come out with fresh material as so many of us missed them first time around. Here is hoping the reports are accurate.